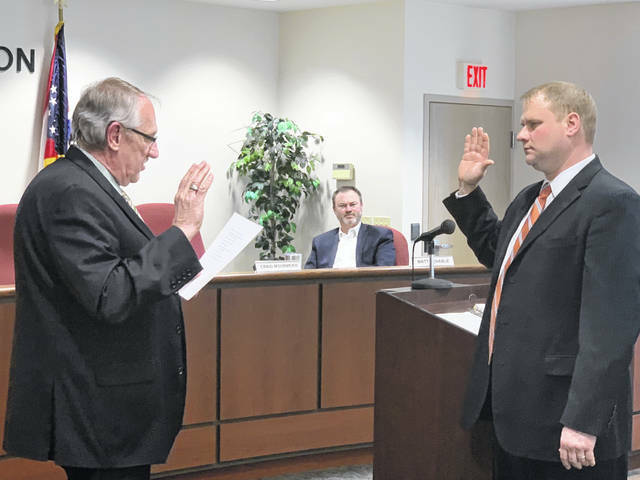 EATON — During a meeting on Monday, March 18, Eaton City Council swore in Ryan Brunk as the city’s new Law Director/Prosecutor. Brunk was in private practice for 15 years, where he prosecuted for the municipality of New Lebanon, the City of Huber Heights, and the City of Riverside. He has also filled in for multiple jurisdictions, including the City of Eaton in the past. He is married with three children and lives just inside the Montgomery County line on Ohio 725, where he actively raises show pigs. “I love prosecuting. I had been in Eaton before, the people in the Eaton Municipal Court are great and talked me into applying for the position. The people out here are great. I wanted to slow down and not do my private practice — I was kind of tired of the rat race of domestic relations law,” he said. Aslaw director/prosecutor, Brunk will be responsible for making sure the City of Eaton is compliant with all of the statutes of the State of Ohio and the United States. He will assist in writing any new legislation and ordinances for the City of Eaton. He will also review contracts, prosecute all of the misdemeanor cases at Eaton Municipal Court, and complete other duties as assigned. Brunk also has plans to create a traffic safety diversion program in Preble County. “We are going to try and do some new things. One thing I am working on is trying to do a driver intervention program. Right now, the Eaton Municipal Court has a diversion program for criminal cases, but not traffic cases. What we are going to try and do is create a traffic safety program or diversion program, to allow people who get a speeding or traffic ticket who would not like to get those points on their record to go through this traffic program, pay a fee, and not get those points assessed,” he said. Ultimately, Brunk is excited to spend the rest of his career in the City of Eaton. “I like prosecuting because I feel I am on the right side, making a difference, and making people’s lives better by reducing crime or punishing people who commit crimes, making their neighborhoods safer. On the other side of that, I would like to think I am helping change the defendants lives, although nowadays it is mostly trying to get them off of narcotics and illegal drugs,” Brunk said.